Lignin is a potential feedstock for microbial conversion into various chemicals. However, the degradation rate of native or technical lignin is low, and depolymerization is needed to obtain reasonable conversion rates. In the current study, base-catalyzed depolymerization—using NaOH (5 wt%)—of softwood Kraft lignin was conducted in a continuous-flow reactor system at temperatures in the range 190–240 °C and residence times of 1 or 2 min. The ability of growth of nine bacterial strains belonging to the genera Pseudomonas and Rhodococcus was tested using the alkaline-treated lignin as a sole carbon source. Pseudomonas fluorescens and Rhodococcus opacus showed the best growth of the tested species on plates with lignin. Further evaluation of P. fluorescens and R. opacus was made in liquid cultivations with depolymerized lignin (DL) at a concentration of 1 g/L. Size exclusion chromatography (SEC) showed that R. opacus consumed most of the available lower molecular weight compounds (approximately 0.1–0.4 kDa) in the DL, but the weight distribution of larger fractions was almost unaffected. Importantly, the consumed compounds included guaiacol—one of the main monomers in the DL. SEC analysis of P. fluorescens culture broth, in contrast, did not show a large conversion of low molecular weight compounds, and guaiacol remained unconsumed. However, a significant shift in molecular weight distribution towards lower average weights was seen. Rhodococcus opacus and P. fluorescens were identified as two potential microbial candidates for the conversion/consumption of base-catalyzed depolymerized lignin, acting on low and high molecular weight lignin fragments, respectively. These findings will be of relevance for designing bioconversion of softwood Kraft lignin. Lignin is one of the most abundant biopolymers on Earth and constitutes 18–32%  of woody biomass by weight and 40% by energy . Its natural abundance, high calorific value and the fact that it is one of the few available renewable sources of aromatic chemicals in nature make it a prime feedstock for targeted valorization towards biofuels, renewable polymer composites, and valuable chemical precursors [3, 4]. Despite this, most large-scale industrial plants that exploit plant polysaccharides have almost exclusively burned the co-produced lignin to generate heat and power desired for biomass conversion and/or product drying, and have not aimed for higher value products . The emergence of biorefineries, which predominately convert the carbohydrate part of cellulosic biomass into liquid fuels, will generate substantially more lignin than needed for process heat or for power generation to the operation, which will add to lignin already generated in the pulp and paper industry. Hence, efforts are underway for lignin conversion into higher value products [6, 7]. Among the three principal polymers in plants, lignin has the most heterogeneous and complex composition and structure, turning its efficient utilization into a major technological challenge. The lignin biopolymer is built from phenyl propanoid units which are substituted at different positions and connected together by ether and C–C cross-links/bonds [8, 9]. It should be noted in this context that the relative contribution of these building blocks is very different between different types of biomass . In addition, there are different techniques for the separation of lignin from lignocellulosic biomass and the resultant lignin vary in terms of bond structures, building block composition, added functional groups, and molecular weight distribution depending on the separation process. Hence, the term “lignin” is per se not very descriptive. A central process step needed for biological lignin valorization is the breakdown of the large lignin macromolecule into smaller compounds that can be converted by microorganisms . This depolymerization process is essential, as only low molecular weight compounds (mono- or possibly oligomers) can pass the cellular membranes of microbes and enter the cellular metabolism. The depolymerization is quite challenging, owing to the distribution of bond strengths in the different C–O and C–C bonds. Ideally, pretreated lignin streams for bacterial conversion should consist of water-soluble monomers. For chemical depolymerization, in particular, char formation and repolymerization of produced phenolic-radicals to large water-insoluble complexes thus need to be avoided. High concentrations are also normally desirable—a value of 100 g/L  has been mentioned—although tolerance of the microbial catalyst to the monomers will likely limit the allowable concentration in the process. Until now, obtained monomeric species in lignin streams are still in the range of only a few g/L . The monomers resulting from chemical depolymerization are quite diverse. In a biological conversion process, it is thus important to choose organisms that have the ability to funnel a large range of the lignin-derived aromatic compounds to central intermediates (mainly protocatechuate and catechol) via the upper-funneling catabolic pathways . The principal intermediates are then further channeled to valuable products using natural or genetically engineered microorganisms [12–14]. In previous studies, microorganisms which are capable of utilizing lignin/model compounds a sole source of carbon have been identified, including Pseudomonas putida, Rhodococcus opacus, Rhodococcus jostii, Amycolatopsis sp., Sphingobium sp., and Cupriavidus necator [15–18]. Successful proof-of-principle studies have been made for the bioconversion of lignin from alkaline pretreated corn stover and organosolv lignin into various products such as PHA, muconate and lipids [11, 19–25]. Apart from monomers, the depolymerization of lignin also results in a heterogeneous mixture of oligomers and higher molecular weight compounds and ability of the selected host organisms to break down these larger fragments represents one process option in which a complete depolymerization is not necessary. This, however, requires the use of organisms which secrete extracellular lignolytic enzymes (e.g. laccases and DyP-type peroxidases). In the present study, we explore the possibilities of utilizing depolymerized softwood Kraft lignin (Indulin AT) as a substrate for bacterial conversion. Softwood Kraft lignin is potentially available at large quantities from pulp mills in Scandinavia . It is a complex substrate with a broad molecular weight distribution and a high average molecular weight, calling for depolymerization in bioprocessing. The alkaline depolymerization of the lignin was performed in a continuous-mode operation without incorporating any capping agents or hydrogen donors, supporting its further scalability and commercial applicability. Nine bacterial species with known aromatic-metabolizing capacity were evaluated for their ability to grow on plates using the depolymerized product, with the objective of finding organisms capable of both extracellular lignin breakdown along with the intracellular aromatic metabolism. Further evaluation of selected strains was carried out in liquid shake flask cultivations using alkaline treated partly depolymerized lignin as a substrate. Additional cultivations were also made with a mixture of selected model compounds representing monomers found in the depolymerized lignin. A commercial Kraft lignin, Indulin AT, which is a pine softwood lignin precipitated from the black liquor of linerboard-grade pulp , was obtained as a dry brown powder from MeadWestvaco Corporation (Charleston Heights, SC, USA). This lignin fraction has a typical moisture content of 4.5 wt% and ash content of 3.5 wt%. The feed of the chemical depolymerization setup was prepared before each experimental run and was characteristically comprised 5 wt% lignin substrate, 5 wt% NaOH, and 90 wt% deionized water. Vacuum filtration for the reactor feed was performed to ensure that no precipitation could take place in the pump and to counteract clogging problems within the pressure valve post reaction. The base-catalyzed (chemical) lignin depolymerization experimental runs were conducted using a tailored bench-scale continuous flow reactor (CFR) as previously described in Abdelaziz et al. . In short, the continuous plug flow reactor system consisted of a Gilson 307 HPLC pump (Middleton, WI, USA) and Salamander tubular CFR reactor (Cambridge Reactor Design Ltd., Cottenham, UK) with a typical volume of 10 mL. The reactor was equipped with a preheater (8 mL) that ensures bringing the reactant mixture to the desired reaction temperatures. The product stream exiting the reactor is further condensed with the aid of a Julabo circulating water bath, and a pressure control valve made from nickel–molybdenum–chromium superalloy (Hastelloy C276; UNS N10276) was installed to maintain the pressure throughout the reaction. A filter was connected directly after the condensation step and attached to the inlet of the pressure control valve to protect it from any char depositions if occurred. The total operating system volume was about 50 mL. The setup was heated up and pressurized to the targeted working conditions, before starting each experiment and then the feed was pumped continuously to the plug flow reactor at volumetric flowrates of 10 and 5 mL/min, respectively. These mixtures flowing through the continuous reactor system correspond to residence times in the heating zone of about 1 and 2 min, respectively. The operating conditions were chosen according to previous work by Abdelaziz et al. i.e. the temperature was below the coking point but high enough to give as high fraction of low molecular weight aromatic compounds as possible in the continuous depolymerization process. The experimental conditions and parameters are summarized in Table 1. For the reaction operating parameters, the temperature was adjusted using a Eurotherm temperature controller (Eurotherm, Ashburn, Virginia, USA) and the pressure was tuned through a backpressure regulator (Bronkhorst High-Tech B.V., Ruurlo, Netherlands). After exiting the reaction zone and throttling the product mixture/effluent to atmospheric pressure, the liquid depolymerized products (bio-oils) were continuously collected and samples were taken for analysis. The collected depolymerized product samples at three different temperatures (190, 220, 240 °C) were used as carbon sources in plate screening experiments. For liquid cultures, the collected lignin products treated at 220 °C and a flow rate of 5 mL/min were used. Nine bacterial strains were used in this study. Pseudomonas putida KT2440 (DSM 6125), Pseudomonas fluorescens (DSM 50090), Rhodococcus erythropolis (DSM 43066) and Rhodococcus opacus (DSM 1069) were purchased from the Deutsche Sammlung von Mikroorganismen und Zellkulturen, Braunschweig, Germany. Pseudomonas putida EM42 was generously provided by Esteban Martínez-García at the Centro Nacional de Biotecnología, Madrid, Spain. Four previously reported isolates (B, C, 9.1 and 19), with tentative identifications, were used. Isolate B (Pseudomonas sp. strain B; DSM 104484) and isolate C (Pseudomonas plecoglossicida strain C; DSM 104486) were isolated from mature compost samples  and isolate 9.1 (Pseudomonas deceptionensis) and isolate 19 (Rhodococcus erythropolis) were isolated from sediments of the Baltic Sea . M9 medium was used for all the solid and liquid culture experiments. The media consists of M9 salts (containing per L: 6 g Na2HPO4, 3 g KH2PO4, 1 g NH4Cl, 0.5 g NaCl), 2 mM MgSO4, 100 µM CaCl2 and 10 mL/L trace element mixture [31, 32]. All the media components were either autoclaved or sterile filtered. The final pH was tuned to 7. If lignin or depolymerized lignin (DL) was used as a carbon source, the pH was adjusted approximately to 7 using 50% H2SO4, before adding it to the M9 medium. At pH 7, the solubility of lignin was poor and hence precipitates were formed; although at the final concentration of 1 g/L, a complete solubility was observed. Henceforth, for liquid culture experiments, a concentration of not more than 1 g/L was used to enable biomass measurements. If lignin model compounds were used as a carbon source, 50 mM stock solutions were prepared and stored (4 °C) for use within 2 weeks. Model compounds, if not soluble in water, were dissolved using a few drops of 5 N NaOH. All the chemicals, reagents and materials used were obtained from either VWR (West Chester, PA, USA) or Sigma-Aldrich (St. Louis, USA), unless specified. Plates were prepared using a final concentration of 1.5% agar in M9 medium. The carbon source utilized was either 4 g/L glucose, 5 mM vanillin/guaiacol or 1–5 g/L DL. The prepared plates were stored (4 °C) until further use. For screening of several organisms in a single plate, the plates were equally gridded and each grid was inoculated with a single strain. The inoculated plates were sealed (parafilm) and incubated (30 °C). The lignin (or lignin model compounds) plates were initially inoculated from a freshly grown glucose plate (in M9 medium). Later, when a few colonies were visible, it was re-streaked on to the fresh plates containing the same carbon source. This was performed to maintain the microbial adaptation to a particular carbon source. Liquid culture experiments were conducted in 250 mL shake flasks containing 50 mL culture media. The carbon source added was either 10 g/L glucose (pre-culture), 5 mM guaiacol, 3 mM each of guaiacol, vanillin and 4-HBA (4-hydroxybenzoic acid), 1 g/L DL supplemented with 5 g/L glucose (high cell density experiments), or 1 g/L lignin/DL (low cell density experiments). For the experiments with DL (or un-processed lignin), the flasks were inoculated using a single colony of the corresponding microorganism from 1 g/L DL plates. Shake flasks with model compounds as a carbon source were inoculated with a fixed amount of biomass, using 10 g/L glucose as pre-culture, to achieve an initial OD of around 0.2 or 0.5. All experiments were carried out in duplicates. The flasks were incubated at 27 °C with agitation (180 rpm). Samples were withdrawn at steady intervals to monitor the biomass density (OD-optical density), change in molecular weight of lignin (SEC-size exclusion chromatography) and consumption of monomers (UHPLC-ultra-high performance liquid chromatography). Biomass growth was measured spectrophotometrically by optical density at 620 nm (OD620). The color of lignin is dark and it significantly affects the absorbance measurements; hence, the culture was centrifuged to remove cells and the obtained supernatant was used as a blank prior biomass measurements. The samples, whenever required, were diluted with water/saline to stay in the linear range of optical density (0.03–0.3), in which case, the supernatant was also diluted with the same factor. Subsequently, the cells were removed by centrifugation (3 min at 12,300 × g) and the supernatants were kept at − 20 °C for UHPLC and SEC analysis. Growth rate, uptake rate and yield were calculated for R. opacus on 5 mM guaiacol. Biomass dry weight was measured at the end of cultivation. This was used to convert the optical density to biomass concentration with a response factor of 0.4. Biomass yield (YSX), expressed in both g/g and g/mmol, was calculated using the phase plane plot of biomass produced and substrate utilized. The maximum specific growth rate (µ) (1/h) was determined from the plot of natural logarithm of biomass in the broth over time. The specific substrate uptake rate (qSubstrate) was calculated by dividing µ with YSX. The frozen samples were thawed, mixed and filtered (0.2 µm pore size) before analysis. A Waters Acquity UPLC system connected with a photodiode array detector (Waters, Milford, MA, USA) was operated for the analysis of phenolic compounds. The column used for separation was Ethylene Bridged Hybrid C18 with a length of 100 mm, 2.1 mm internal diameter and 1.7 µm particle size. Samples were injected at a volume of 2.5 µL and the temperature of the column was kept at 47 °C. The mobile phase was composed of 3% acetonitrile, 95% water, 2% acetic acid (fraction A) and 85% acetonitrile, 13% water, 2% acetic acid (fraction B). The analysis method was obtained from Schwarz et al. with minor modifications. A flow rate of 0.6 mL/min was used. The LC gradient elution method is as follows: 100% A at time 0, decreased to 90% A in 5 min, held at 90% A for 2 min and decreased to 25% A in 4.5 min. Following the gradient, the column was washed for 5 min with 100% B and was equilibrated for 5 min with 100% A. The chromatographic system was controlled by Acquity UPLC Console and the data were processed using Empower 3 software. If unknown peaks appeared as a result of metabolic intermediates excretion, MS–MS analysis  was performed to identify and confirm the respective compounds. Later, the identified peaks were quantified using standards in UHPLC. The molecular weight distributions (MWDs) of different lignin samples were determined employing a size exclusion chromatography (SEC) system, following an established method . The setup adopted for the size measurements was a Waters 600E high-performance liquid chromatography (HPLC) system (Waters, Milford, MA, USA) equipped with a Waters 2414 refractive index detector, a Waters 486 ultraviolet (UV) tunable absorbance detector, and an analytical column packed with 30 cm of Superdex 30 and 30 cm of Superdex 200 (GE Healthcare, Uppsala, Sweden). The column was operating at ambient temperature and eluted with 125 mM NaOH solution (analytical grade) as the mobile phase at a flowrate of 1.0 mL/min. Calibration was carried out using polyethylene glycol (PEG) standards ranging from 400 to 35,000 g/mol in the eluent (Merck Schuchardt OHG, Hohenbrunn, Germany). The samples were diluted at concentrations of 1 mg/mL in the eluent and the solutions were filtered using a 0.2 µm filter (Schleicher and Schuell, Dassel, Germany) to get rid of any suspended matter. Finally, about 500 µL from the filtered solution was injected into the SEC system for data acquisition. Due to comparison with incorporated PEG standards, both the molecular weight and the molecular number should be interpreted relatively. The molecular weight distribution (MWD) of the depolymerized Kraft lignin as assessed by SEC was in good agreement with previously reported measurements by Abdelaziz et al. . The analyses of samples obtained at three different temperatures, as well as the original (untreated) lignin are shown in Fig. 1. The untreated Indulin Kraft lignin exhibited a rather wide-range distribution from 0.1 to 100 kDa with a peak molecular weight average (Mp) around 4 kDa—estimated based on the used PEG standards—and most of the starting lignin material had a molecular mass larger than 1 kDa (Fig. 1a). The MWDs of the DL products, on the other hand, gradually shifted towards lower molecular mass components with increasing reaction temperature, and the fraction with a molecular weight higher than 10 kDa was very small at a depolymerization temperature of 240 °C. A bimodal curve distribution, with a second peak at 0.2–0.4 kDa—representing mainly monomeric and dimeric fractions was shown at 220 °C. Increased lignin solubilization was obtained at the higher depolymerization temperatures, and higher reaction temperatures gradually yielded more monomeric and dimeric compounds, in agreement with our previous work . The shift of the MWD was more pronounced at the higher residence time (Fig. 1b), and the fraction of components larger than 10 kDa was almost depleted already at a temperature of 190 °C. The peak around 0.4 kDa was more distinct and higher with a longer residence time (2 min), and increased more distinctly with reaction temperature. UHPLC analysis of fractions collected after SEC revealed the presence of aromatic monomers in the 0.4 kDa peak fraction (Additional file 1: Figure S1). The monomers were subsequently identified and quantified using UHPLC (see: Shake flask experiments with depolymerized lignin-Monomer analysis). To identify bacteria able to grow on DL, growth on plates was tested for nine bacteria/isolates previously known to metabolize aromatic compounds or isolated on lignin-media [17, 29, 30, 35, 36]. The lignin used in this screening had been depolymerized at two different flow rates (5 and 10 mL/min) and three different temperatures (190, 220 and 240 °C) for each flow rate, i.e. at six different conditions. The concentration of DL used was 5 g/L, but there was no visible growth on plates for the first 3 weeks. Hence, another set of plate screening experiments were made with a reduced DL concentration (2 g/L). Within the first 2 weeks, colonies were formed by R. opacus on almost all plates—although only a few at each plate. After one additional week, some colonies were also seen for a few other organisms (Table 2). The growth on plates was somewhat ambiguous for some of the organisms, but was clearly seen when those organisms were re-streaked onto fresh plates with 1 g/L DL (not shown). Rhodococcus opacus showed growth on the largest number of plates (12), followed by P. fluorescens (8). These two organisms were chosen for experiments with liquid cultures on DL. In addition, P. putida EM42 was included due to the well-known robustness of its parental strain KT2440 . Furthermore, the strain EM42 is streamlined for industrial applications by heavy genome editing and hence of interest as a host organism . M9 medium with DL 1 g/L, produced at a flow rate of 5 mL/min and a temperature of 220 °C was used in these experiments. The yield of lower molecular weight lignin compounds appear to be somewhat higher at 240 °C based on the SEC analyses. However, this temperature is close to the coking point (250 °C) , and for reasons of operational stability temperature of 220 °C was chosen. Low inoculum flask experiments (initial OD < 0.01) were conducted with both depolymerized and non-depolymerized lignin. A non-inoculated control flask was also included to monitor potential changes in OD due to lignin precipitation. 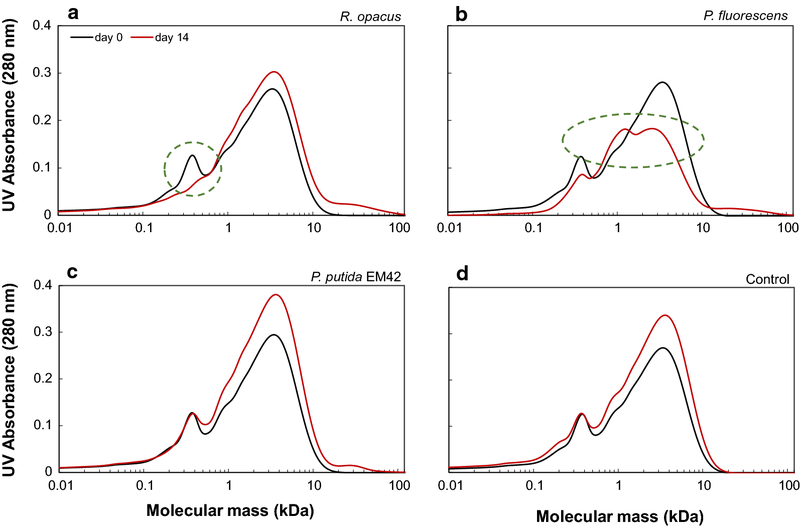 The OD in cultures of P. fluorescens reached a plateau after 1 day at value of about 0.1, and similar trend was seen for P. putida EM42 and R. opacus, but on day 2 and 3, respectively (Fig. 2a). P. fluorescens formed aggregates after 4 days and thereafter it was not possible to measure the cell density by OD. The aggregates were recognized as bacterial clusters from microscopic inspection. For all organisms, formation of biofilms was seen at the air–liquid interface of the flask after 4 days. The biofilms were re-suspended before sampling. In case of non-depolymerized lignin, the increase in OD was lower, but a small growth was detected for all three organisms in the first 2 days, after which the OD stayed constant until day 14 (Fig. 2b). The maximum OD reached for non-depolymerized was approximately only one-third of that obtained with depolymerized lignin, which is in line with the lower availability of monomers/oligomers for direct consumption in the unprocessed lignin. From SEC analyses, it was found that the low molecular weight fraction (0.1–0.4 kDa) of the DL disappeared within 4 days in the cultures with R. opacus, indicating a possible consumption of these compounds (Fig. 3a). In the cultures of P. fluorescens, the peak for compounds between 0.1 and 0.2 kDa disappeared, and minor effects were possibly seen also for other fractions in the first 4 days (Fig. 3b). In the case of P. putida EM42, only compounds between 0.1 and 0.2 kDa disappeared, with no other change in the MWD (Fig. 3c). The peak area and height for the SEC analyses at day 14 was increased for all cultivations, which is probably due to lignin reconfiguration/repolymerization (Fig. 3a–c). UHPLC analysis showed the presence of several monomers, some of which have previously been identified by supercritical fluid chromatography–mass spectrometry [28, 38]. The previously identified compounds found in the DL were 4-HBA (retention time 1.6 min), vanillate (2.4 min), vanillin (3.5 min), guaiacol (4.6 min) and acetovanillone (4.7 min). These monomer peaks were quantified by UHPLC and the yields based on initial lignin were found to be 3.5, 1.3, 0.95, 0.31, and 0.27 wt% respectively for guaiacol, vanillin, acetovanillone, vanillate and 4-HBA, which adds up to a total monomer yield of 6.3 wt%. From the UHPLC chromatograms, it appears that all three organisms consumed 4-HBA, vanillate and vanillin within 4 days (Fig. 3d–f). In addition, R. opacus consumed guaiacol and an unknown compound giving a peak eluting at 0.8 min. None of the organisms consumed acetovanillone. Experiments were also made in which glucose (5 g/L) was added as a second carbon source, allowing an initial growth phase and a higher biomass concentration for conversion of the DL (1 g/L). All organisms showed growth due to glucose (Fig. 4a), and the fastest growth was found for P. putida EM42 which obtained its maximum OD within 24 h. P. fluorescens achieved its maximum OD within 2 days. For R. opacus the initial growth phase lasted 5–7 days, but the OD kept increasing slowly throughout the entire experiment (Fig. 4a). Similar to the experiments with low cell density, P. fluorescens formed aggregates after day 4, and hence it was not possible to monitor the cell density beyond that time. Interestingly, there was a noticeable change in media color and a significant reduction in color was visible for P. fluorescens (Fig. 4b). SEC analyses showed that the lower molecular weight fraction (between 0.1 and 0.4 kDa) was consumed by R. opacus, similar to the experiments without glucose (Fig. 5a). There was, in contrast, a large change in the SEC chromatograms in the cultivations of P. fluorescens. The peak height of the largest fraction (2–7 kDa) was markedly reduced. Part of the lower molecular weight fraction also remained unconsumed. The SEC chromatogram of P. putida EM42 was almost the same as the control, i.e. no major conversion of any fraction was found. An overall increase in peak height between 1 and 10 kDa was observed also for the control, which shows that this change is not due to microbial activity. A slight increase in molecular weight between 15 and 100 kDa was observed for all the inoculated samples (Fig. 5). The UHPLC chromatograms show similar patterns for the conversion of the monomers by all the three organisms as in the experiments without added glucose (Fig. 6). However, one significant difference was the occurrence of new large peaks at short residence times (0.4–0.5 min) in the experiments with P. fluorescens (Fig. 6b). The UHPLC analyses of shake flask experiments using DL, indicate consumption of guaiacol by R. opacus (cf. Figs. 3d, 6a), a not very common feature among microbes. Consumption of guaiacol was, therefore, tested in shake flask experiments of R. opacus using guaiacol (5 mM) as the only source of carbon and energy, and growth on guaiacol was indeed confirmed (Fig. 7). Inoculum was taken from agar plates with guaiacol and no lag phase was observed in the shake flask cultures. A specific growth rate of 0.2 (± 0.001) h−1 and a biomass yield of 0.7 (± 0.02) gcdw/g was obtained and a complete conversion of guaiacol was achieved with a specific conversion rate of 2.4 (mmol/gcdw/h). The main identified low molecular weight aromatic compounds in the DL apart from guaiacol were vanillin, vanillate and 4-HBA (4-hydroxybenzoate). Additional shake flask experiments were made, in which a mixture of 3 mM each of guaiacol, vanillin and 4-HBA served as carbon and energy source for growth of R. opacus, P. fluorescens and P. putida EM42. These three compounds also represent different branches of the upper funneling/β-ketoadipate pathways . The fastest growth was obtained for P. putida EM42, which reached its maximum OD in 6 h (Fig. 8a). Vanillin and 4-HBA were converted/consumed almost simultaneously. Vanillin was converted to vanillic acid and the excreted vanillic acid was subsequently taken up (Fig. 8a). 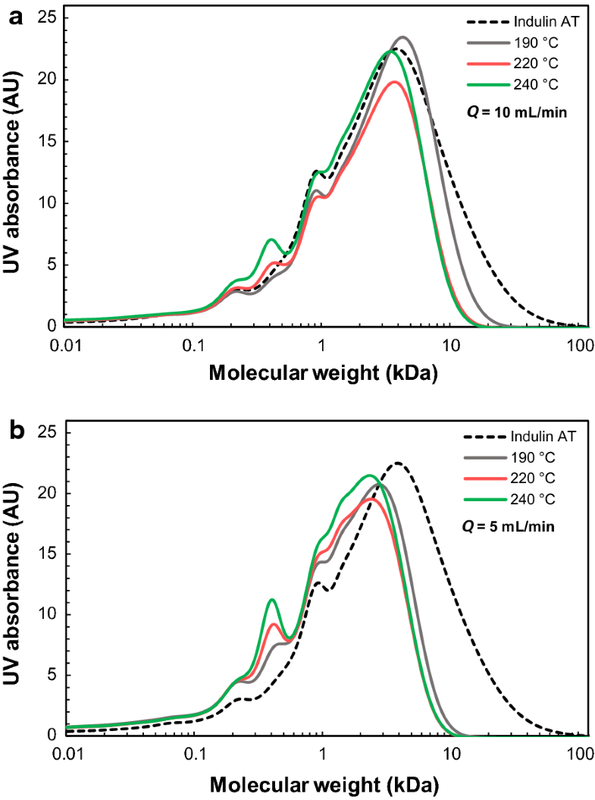 Guaiacol, however, remained unconsumed even after 200 h. P. fluorescens showed a somewhat longer lag phase, but after this, vanillin and 4-HBA were simultaneously converted/taken up (Fig. 8b). The conversion of vanillin to vanillic acid was similar to that of P. putida EM42 and guaiacol remained unconsumed for 200 h. Multiauxic growth was observed in case of R. opacus, which reached its maximum OD in around 50 h (Fig. 8c). The substrate consumption was sequential starting with 4-HBA, which was consumed in 11 h. After the depletion of 4-HBA, guaiacol was consumed within 17 h. Interestingly, R. opacus converted vanillin to vanillyl alcohol—partly concomitant with the conversion of 4-HBA and guaiacol. A slight excretion of protocatechualdehyde was observed in the medium. The remaining vanillin and the excreted protocatechualdehyde and vanillyl alcohol were all consumed around 50 h (Fig. 8c). The present study aimed to identify bacterial strains capable of bioconversion of Indulin AT—a technical softwood Kraft lignin. Kraft lignin is a complex substrate with high molecular weight making it a difficult substrate for direct microbial uptake, and therefore, a previously developed alkaline depolymerization method was employed to break down a part of the higher molecular weight lignin fragments into compounds of lower molecular weight . The nine bacterial strains/isolates (cf. Table 2) examined here have been previously reported to metabolize lignin-related compounds [17, 21, 29, 35, 36, 39], and fall into two phyla (Proteobacteria and Actinobacteria), with a significant evolutionary distance between them. During the plate screening with DL, an initial concentration of 5 g/L was already inhibitory and hence no growth was observed within the first 3 weeks. It is well-known that several aromatic compounds, e.g. vanillin, are inhibitory to microbial growth and metabolism of many bacteria and yeasts . However, the total concentration of quantified aromatic monomers was only in the range of few millimoles (2.3 mM) in 5 g/L DL, well below the concentrations of the defined medium tested at which P. putida EM42, P. fluorescens, and R. opacus all grew (Fig. 8). This suggests that the inhibition is due to the presence of other unknown toxic compounds present in the depolymerisate. When the concentration was decreased to 2 g/L DL, a few colonies appeared in 2 weeks. An adaption of at least 2 weeks was essential for the organisms to initiate growth on DL plates (Table 2). Upon re-streaking to new lignin plates, the growth was rather quick (3 days). 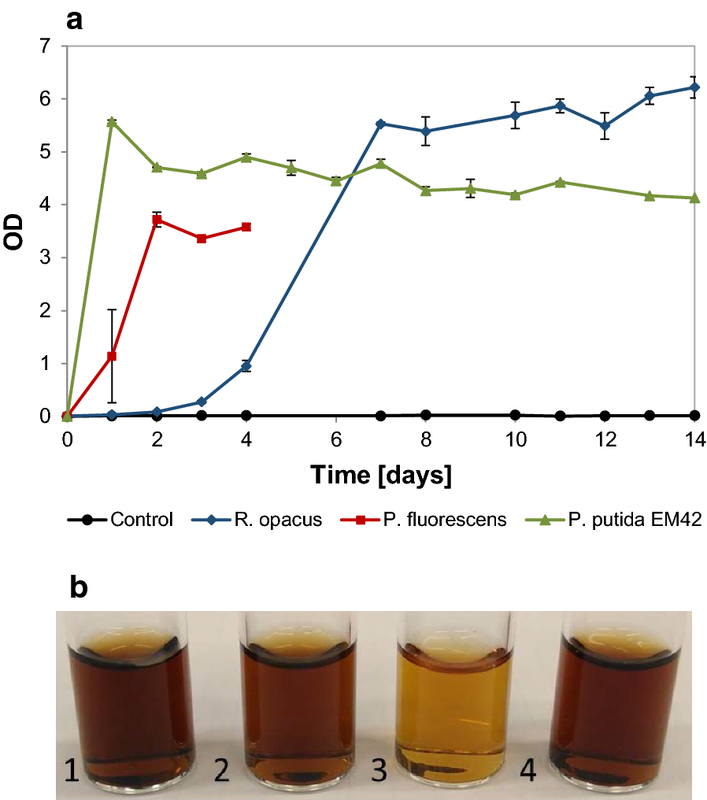 In liquid cultures of R. opacus, P. fluorescens and P. putida EM42, the initial increase in OD was due to the uptake of the readily available low molecular weight lignin compounds in the DL. Later, there was a stationary phase for 8–10 days, after which a slight further growth could be seen (Fig. 2a). Possibly, enzymes for the breakdown of HMW (higher molecular weight) lignin were expressed during this time and LMW (lower molecular weight) fragments were obtained. It was not possible to measure the growth of P. fluorescens after the first 3 days due to the aggregation of cells in the culture medium. Such behavior of cell aggregation and increased hydrophobicity has previously been observed in P. putida CP1 [41, 42] and P. fluorescens  when grown under stressful conditions. Due to the reduction in size of cells under these conditions, the increase in cell counts were in disagreement with the cell dry weight and optical density . The SEC analyses at day 14 indicated an increase in the average molecular weight (Fig. 3). The main change—at 1–10 kDa—was observed not only for the inoculated cultures, but also for the non-inoculated lignin (cf. Figure 5d). This phenomenon is, therefore, probably not a result of microbial action, but may be due to instability of lignin fragments, which undergoe reconfiguration and results in higher UV absorbance. The slight increase in molecular weight (in the range of 15–100 kDa) for all the inoculated flasks in high cell density cultures (Fig. 5a–c) is probably due to the secretion of extracellular laccases. Even though the secreted extracellular enzymes are expected to break down the higher molecular weight lignin, they are also known for polymerizing phenolic compounds . The balance between the depolymerizing and polymerizing abilities of these enzymes depends on several factors (reaction temperature, origin of enzyme, feedstock structure, etc.) and have been previously reported . The use of cultures with glucose as a co-substrate together with DL revealed the ability of P. fluorescens to break down the HMW fraction (Fig. 5b). Both the reduction in color of the DL media (Fig. 4b) and the reduction of peak size in the UHPLC chromatograms after 10 min (Fig. 6c) clearly showed that this organism degrades HMW lignin fragments. It was not determined to what extent the degradation products were consumed. Additional peaks appearing in the UHPLC chromatograms indicated that at least not all the generated compounds were consumed (Fig. 6b). This is in agreement with reports by Salvachúa et al. on P. fluorescens Pf-5, which was found able to depolymerize HMW lignin, but was not able to consume the produced monomers . In contrast to a few previous reports on the ability of P. putida KT2440 to breakdown HMW lignin [20, 21], no such behavior was observed for EM42 strain, despite its genetic similarities with KT2440 . This could be due to the different lignin source used in this study, since the lignin obtained from corn stover differs much from the technical lignin (Indulin AT) in terms of the structure, primary building blocks and successive breakdown products [45, 46]. 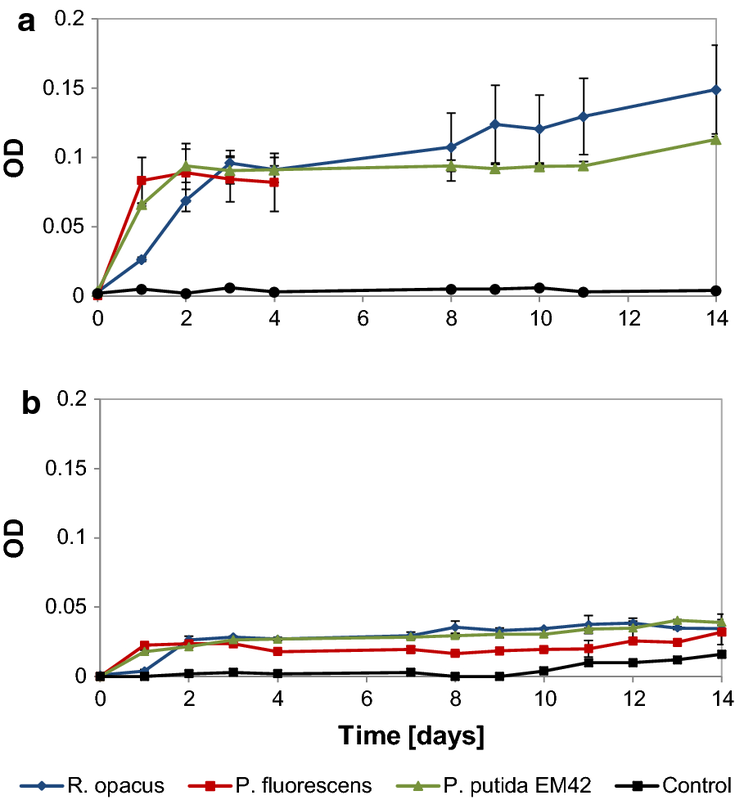 R. opacus has previously been reported to break down HMW corn stover lignin to some extent, but a larger conversion was obtained with R. jostii in the same study . Co-fermentation using both these strains furthermore proved to increase the conversion significantly . Laccases and peroxidases are known to be responsible for higher molecular weight lignin breakdown [47, 48]. Hence, BLAST (Basic Local Alignment Search Tool) searches  were performed using well characterized DyP-type peroxidases [50, 51] and laccases  against the genome of P. fluorescens, P. putida KT2440 and R. opacus to discover if there are any putative enzymes responsible for lignin breakdown (Additional file 1: Table S1 and S2). Two enzymes from the subfamily of DyPA and three from DyPB were selected from R. jostii RHA1 and P. fluorescens Pf-5 [16, 53, 54]. As the enzymes from subfamily DyPC and DyPD were not found/annotated either in Pseudomonas or Rhodococcus group of organisms, those were selected from the well-studied Amycolatopsis sp. 75iv2 and Bjerkandera adusta, respectively [50, 55]. Additionally, two laccases were selected, one from P. fluorescens and another from R. opacus PD630. It seems that laccases, DyPA and DyPB are widely present (Note the absence of DyPA in KT2440) in all the three organisms used in this study (Additional file 1: Table S1 and S2). However, the inability of R. opacus and P. putida to depolymerize the HMW lignin to the expected level might be due to the inefficiency of enzyme secretion or due to the lack of gene expression in the given environment. P. fluorescens was the only organism in which proteins similar to DyPC and DyPD were found (Additional file 1: Table S1). Steady-state enzyme kinetics of the DyP subclasses has revealed that C and D type DyPs have higher peroxidase activities than A and B type DyPs , possibly explaining the much more efficient degradation of high molecular weight lignin fractions by P. fluorescens than by the other organisms studied. The growth of organisms on the mixture of model compounds was in good agreement with their growth on DL—regarding the consumption of monomers. Depending on both the origin of lignin, its mode of separation and the method of depolymerization, a very different distribution between the formed low molecular weight compounds can be obtained. Previously identified compounds in the depolymerized softwood lignin samples using the depolymerization method employed here, have been 4-HBA, vanillate, vanillin and guaiacol . Similar compounds were also reported in other related substrates (Table 3). These compounds belong to different branches of the upper funneling pathways, which mostly converge to either protocatechuic acid or catechol that eventually enter the beta-ketoadipate pathway and promote cell growth . In this study, 4-HBA, vanillin and vanillate were consumed by all the three organisms, shown both from liquid cultures on DL and in model media. 4-HBA, which belongs to the p-coumaryl branch of the upper funneling pathway, has been reported to be converted by a number of microbes, including Acinetobacter baylyi, Cupriavidus necator, P. aeruginosa, and is apparently not very toxic [29, 57–59]. In contrast, vanillin and guaiacol (belonging to the coniferyl branch of the funneling pathway) have been reported to be quite toxic to many organisms [60–65]. Microbial detoxification mechanisms of vanillin are related to conversion of its aldehyde group either by oxidation to vanillic acid or by reduction to vanillyl alcohol . The conversion of vanillin towards the less toxic intermediate vanillic acid is common in Pseudomonas species [29, 67]. The vanillic acid is—possibly following a period of excretion and accumulation in the medium—further converted to protocatechuic acid entering the beta-ketoadipate pathway. This was observed in our liquid cultivations for P. fluorescens and P. putida EM42 (Fig. 8a, b). Strong effects on gene expression have been reported when vanillin was provided as a sole carbon source to P. putida KT2440. The expression of more than 600 genes was changed, including the beta-ketoadipate pathway but also the central energy metabolism and genes associated to solvent tolerance . Interestingly, in our study R. opacus converted vanillin to vanillyl alcohol in the presence of other carbon sources (guaiacol and 4-HBA) (Fig. 8c). The detoxification of vanillin to vanillyl alcohol is mainly reported in yeasts , but also in some bacterial species such as Gluconacetobacter xylinus, which converted vanillin (0.5 mM) to vanillyl alcohol at 80% yield, in the presence of 25 g/L glucose . In the current study, the excretion of vanillyl alcohol stopped after exhaustion of 4-HBA and guaiacol and the remaining vanillin was metabolized within 50 h. Enzymes responsible for vanillin degradation (vanillin dehydrogenase, vanillate O-demethylase and vanillyl-alcohol oxidase) have been identified in Rhodococcus, but during growth on vanillin, vanillate O-demethylase was found to be more upregulated than vanillin dehydrogenase . The inefficient expression of vdh (vanillin dehydrogenase) is a possible reason for the detoxification of vanillin to vanillyl alcohol instead of the more common vanillic acid. The slight generation of protocatechualdehyde could be due to the action of the guaiacol demethylase system, which must be highly expressed in this mixture. This system could recognize vanillin with lower affinity removing its methoxy moiety and giving rise to small amounts of protocatechualdehyde. Guaiacol is one of the main depolymerization products in alkaline treatment of softwood lignin . R. opacus was the only organism tested which showed growth on guaiacol plates (Additional file 1: Table S3). 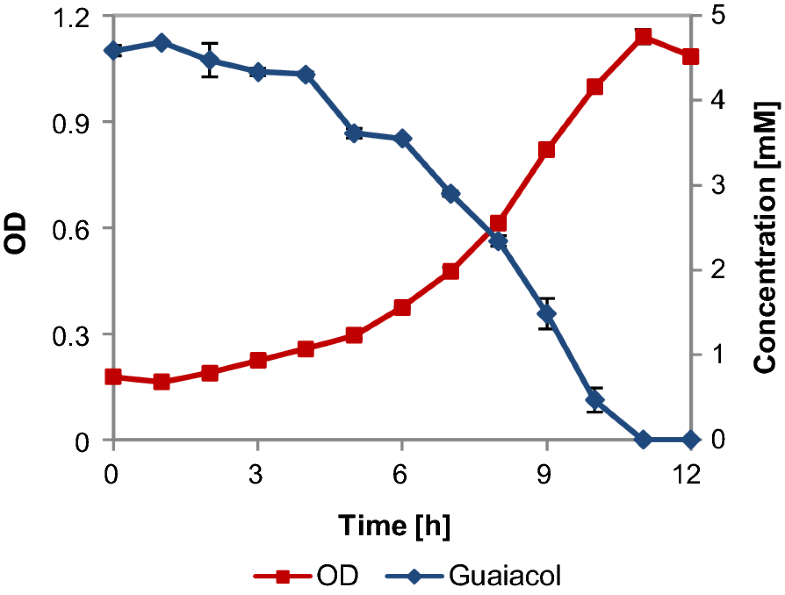 When grown in liquid cultures, the growth rate on guaiacol was 0.2 h−1, which is slightly higher than the growth of the same strain on vanillin (0.127 h−1) and 4-HBA (0.126 h−1) . Some species of Rhodococcus have previously been reported to be able to grow on guaiacol [78–80] or possess genes related to guaiacol breakdown . The sequence of the enzyme (Cytochrome P450, UniProtKB: W4A0P3) responsible for the conversion of guaiacol to catechol from R. rhodochrous (ATCC 21198)  was blasted against the genome of the R. opacus (taxid: 37919) and an identity of 81% was found, which strongly indicates the presence of a similar protein. When the same enzyme was blasted against the genome of KT2440, no similar protein was found and with P. fluorescens (taxid: 294) only a protein with low identity (28%) was found. Pseudomonas sp. strain PN-1 has been reported to convert guaiacol to catechol under anaerobic conditions . It was suggested that the anaerobic demethylation system of this species has a broader specificity in the degradation of lignin molecules than the aerobic enzyme . P. putida KT2440 possesses genes encoding proteins necessary to metabolize catechol , and the addition of genes responsible for the guaiacol-demethylating cytochrome P450 might be very interesting to expand the range of substrates which the organism can utilize. As the softwood lignin contains a significant amount of G-type lignin, the utilization of guaiacol remains essential. Lignins of different origin vary significantly in their composition, and the fragments generated after depolymerization are strongly affected by the type and severity of the treatment. Softwood Kraft lignin is a rather complex substrate, which has been less studied than corn stover lignin for biological valorization. Here, microbial conversion of alkaline-treated Indulin AT—a softwood-based Kraft lignin—was demonstrated. Bacterial growth on the pretreated (partly depolymerized) lignin was clearly better than the growth on unprocessed lignin. Of the bacterial strains tested, R. opacus was able to consume most of the LMW compounds and HMW lignin was also converted to some extent. P. fluorescens showed a considerable ability for breakdown of HMW lignin. Even more interesting was the ability of R. opacus to consume guaiacol, which is monomer present in appreciable amounts after the depolymerization of softwood-based lignin. The yields of monomeric compounds obtained after depolymerization of softwood Kraft lignin typically amount to only a few percent, and this would need to be substantially increased for any commercial process. However, the organisms of this study are certainly of interest—either as potential host organisms, or sources of genetic material, in development of microbes for the production of fine/bulk chemicals from softwood lignin. The authors have retracted this article  because due to a mistake in the laboratory, SEC analyses of some of the lignin samples used had already been published as part of another article . The data in the section “Characterization of depolymerized lignin streams” was therefore inaccurately presented as new, and part of the materials and methods section was incorrect. To avoid confusion this article has been retracted and the authors have been given the opportunity to resubmit their corrected data. All authors agree to this retraction. Ravi K, Abdelaziz OY, Nöbel M, García-Hidalgo J, Gorwa-Grauslund MF, Hulteberg CP, Lidén G. Bacterial conversion of depolymerized Kraft lignin Biotechnol Biofuels, 11:240, 2018  Abdelaziz OY, Li K, Tunå P, Hulteberg CP.Continuous catalytic depolymerisation and conversion of industrial kraft lignin into low-molecular-weight aromatics. Biomass Convers Biorefinery, 8:455–70, 2018. An erratum to this article is available online at https://doi.org/10.1186/s13068-018-1307-5. GL, CH and MGG conceived the project. KR, OA, JGH and GL designed the study. KR, OA and MN performed the experiments. All authors discussed and interpreted the results. KR and OA drafted the manuscript. GL, CH and JGH revised the manuscript. All authors read and approved the final manuscript. This research was financed by the Swedish Foundation for Strategic Research (SSF) through the Grant Contract RBP14-0052. C. Hulteberg also acknowledges the Swedish Energy Agency (Contract No. 41288-1). We would like to thank Esteban Martínez-García from CNB (Madrid, Spain) for kindly providing a bacterial strain and Per Tunå for the valuable support with CFR setup. We are grateful to Jens Prothmann and Sofia Essén for the help with MS analysis, Kena Li for assisting in depolymerization experiments, and Johan Thuvander for the technical support with SEC. 13068_2018_1240_MOESM1_ESM.pdf Additional file 1: Figure S1. (a) The SEC chromatogram of 1 g/L depolymerized (at 220 °C, 5 mL/min) lignin. Red dotted lines represent the fractions collected. The collected fraction at 95–108 min corresponds to the 0.2–0.4 kDa peak in the SEC chromatograms calibrated with PEG standards. (b) UHPLC chromatograms of the fractions obtained from SEC. The peaks in the fraction 95–108 min correspond to aromatic monomers (Vanillin-3.5 min; guaiacol-4.6 min; acetovanillone-4.7 min). Table S1. Results of homology BLAST with the previously well-characterized DyP proteins against the genome of the organisms used in this study. P. putida EM42 strain used in this study is the modified version of KT2440 and hence the genome of KT2440 (parental strain) was used for BLAST searches. Proteins with identity more than 75% are emphasized in green. Proteins that were found absent and the ones with less than 30% query are highlighted in red. P. fluorescens highlighted in blue is the only organism with proteins similar to DyPC and DyPD. Table S2. Results of homology BLAST with laccases against the genome of the organisms used in this study. P. putida EM42 strain used in this study is the modified version of KT2440 (parental strain) and hence the genome of KT2440 was used for BLAST searches. Proteins with identity more than 75% are emphasized in green. Table S3. Growth of bacterial strains on agar plates with 5 mM vanillin/guaiacol as the only source of carbon in M9 medium, incubated for 2 weeks at 30 °C. The isolates were previously tentatively reported as Pseudomonas sp. (B); P. plecoglossicida (C); P. deceptionensis (9.1); and Rhodococcus erythropolis (19). Duplicate experiments were performed and the growth results were similar (++ abundant growth; + growth; − no growth). R. opacus was the only organism to show growth on guaiacol (highlighted). The eLignin Microbial Database. http://www.elignindatabase.com/. Accessed 12 Apr 2018.